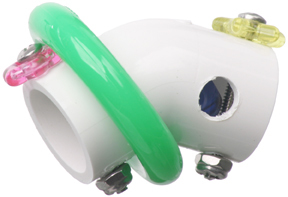 1/2” PVC elbow with Marbella bead inside and Marbella ring on outside. Stainless steel screws and nuts hold bead inside for lots of tongue teasing fun. and watch how they get their treat out of those little holes. Easy to wash and will last for many years to come. Foot toy with tons of shredding fun! Clear tube with PVC end caps filled with colorful beads and a plastic ring. Plastic Dinosaur with Leather, beads and pacifiers.